Aiming to capitalise on the GCC countries’ plans to invest over $300bn in energy projects by 2020; Amr Belal, Managing Partner at powergreen shares his plans for the future. Why have you chosen Qatar as your base? Our business has been established in Qatar since 2009. The decision at the time was straightforward, since the founding team was located in the country and the business areas that we tapped into were underserviced in the market. Since then, we have expanded our reach to the near region and opened offices in markets where setting up a team was relatively quick and easy. Today we occupy a prominent position in the renewable energy sector in Qatar; our scope of work has evolved across the many projects we continue to implement and applying the gained expertise to our new engagements strengthens our prospects while benefiting our clients. Over the past seven years of our business operation, we have achieved significant progress in establishing a renewable energy business in Qatar that has delivered flagship projects in the country. The rebranding came as part of a corporate spin-off that saw the Green Division at Innovations Unlimited ME (IUME) take on a new identity “powergreen”, which, going forward, operates as a fully owned subsidiary of Innovations Unlimited ME. The launch of powergreen supports our goal of reinforcing market position in the area of renewable energy and expands on our success in offering turnkey solutions to clients across the Middle East, while IUME remains operational in its other business activities. The name itself describes distinctively the nature of our business which aims to power a green, sustainable transformation in our approach to energy access and efficiency. You have said you are a market leader when it comes to renewable energy in Qatar – on what is this based? In our role as system integrator and EPC contractor of Renewable Energy Solutions, we have focused on building our expertise in this capacity from the beginning. 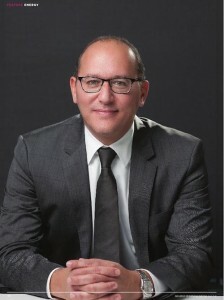 Having started our activity at the burgeoning of this market in Qatar, we have been in a unique position to capture the early opportunities. These projects had been driven by the enforcement of sustainability certifications in the built environment and our proposed solutions were tailored to address this need. Our portfolio has consistently continued to grow since then, having developed the local project references that bolster the client’s confidence in our capacity, adding up to the international experience of our technology partners. The number of projects completed and underway combined with the aggregate installed capacity (and the technology diversity) puts us in the forefront of market players. The awarding of utility scale solar projects will draw the definite line for a market leader in the next couple of years; we highly anticipate this new phase in Qatar’s environmental strategy application. 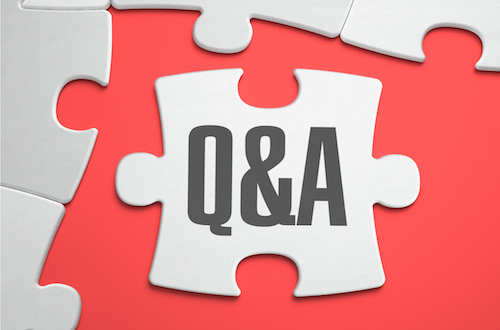 What sort of project work have you carried out in Qatar so far? Qatar has set a target to generate 20% of its energy needs from renewable sources by 2030. As a first step to achieving that, the country had started by encouraging sustainability measures in the built environment. This is where a good part of our work takes place at the moment; in projects such as Msheireb Downtown which hosts a series of PV and solar water heating installations; or green buildings in Lusail City and Energy City, all of which represent solar rooftop applications. Other projects driven by the national utility company, Kahramaa, deploy solar street lights that conveniently equip isolated substations with reliable light sources. We see increasing adoption of solar lighting solutions given their economic advantage and the ease of implementation. Al Sadd Multipurpose Hall, which is a 4-star GSAS project we completed in 2015, has been awarded the “Sustainable Project of the Year” Award for 2015 at the Construction Week Awards ceremony for the Middle East. It represents the first solar sports facility in Qatar, which will pave the way for upcoming stadiums being constructed for the 2022 games. In addition to design and construction, our service contracts include operation and maintenance that we carry out for our projects as well as third parties; ensuring optimized power output through effective monitoring, maintenance and cleaning. Our projects pipeline continues to grow and we definitely see increasing confidence from clients in the potential of solar solutions. It reflects in the growing project size and the more meticulous specifications of RFPs. Solar technology is becoming cheaper and cheaper – is Qatar, like the rest of the Gulf, finally seeing the merits of wide-scale renewable energy implementation? 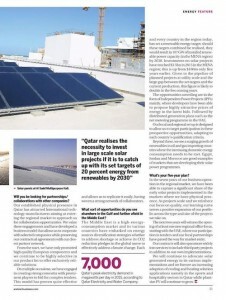 Qatar realizes the necessity to invest in large scale solar projects if it is to catch up with its set targets of 20% energy from renewables by 2030. Not only is the technology getting cheaper, but the prices of energy generated from utility scale solar plants have hit record lows in recent years, clearly gaining a competitive edge with hydrocarbons. On a similar note, the declining oil prices that have taken the energy market by storm in the past months do not seem to threaten the solar industry as some might think. On the contrary, lower revenues from oil trading are pushing gulf countries to slowly take out fuel and electricity subsidies which we will see in Kuwait, Saudi Arabia, Oman and the UAE; adding prevalence to solar. That said, Qatar might have been cautious to date with the larger projects on its agenda, however implementations in the built environment and in certain infrastructure projects are ongoing and its journey to 2022 will unravel the greater part of its sustainability strategy. What new technologies are you planning to implement? On a global scale, the majority of renewable energy generation is achieved from Hydropower, followed by wind power and solar Photovoltaic. 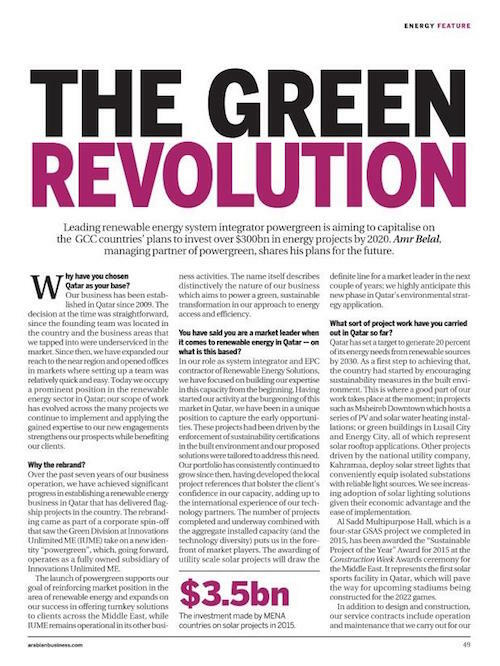 In the GCC region, naturally the focus is on solar power to leverage the abundance of the source. Since 2008, solar has consistently accounted for the highest average annual growth in power generation in the region. 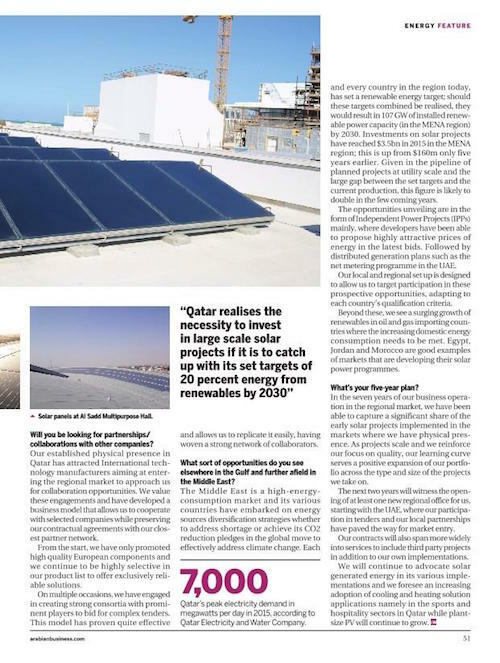 The next phase of implementations in Qatar is going to consist of large scale PV plants and solar stadiums while green buildings continue to grow. Our capabilities support both areas. For power plants, the proven technology is photovoltaics for its high efficiency per square meter, lower cost and simpler maintenance. For solar stadiums and sports precincts, the applications can vary. Building integrated photovoltaics (BIPV) can support the façade design side while achieving power efficiency and power generation. Solar PV applications can be tailored for power generation or more particularly for cooling purposes, which is gaining attention, as well as water heating. Other applications are also possible and our service portfolio offers these as turnkey solutions. Is there much scope for more wind projects in Qatar? Initial feasibility studies conducted by research institutes in Qatar have identified offshore wind as more favourable for energy generation. Measured throughout the year, wind speed over Qatar capped the critical speed for 80% of the time. These are good conditions for medium and small wind turbines, which are feasible for limited energy generation. Our triple wind turbines installation in Qatar is located within Kahramaa Awareness Park and serves as demonstration of onshore wind efficiency. Once the park becomes operational, we will be able to read more accurate data from the system itself. 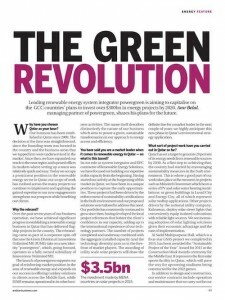 You have said you are targeting a large share of Qatar’s renewable energy business – what’s the strategy for achieving this? Our current projects, implemented and underway, represent the larger part of renewable energy installations in Qatar at the moment. Our project pipeline reflects at least double this installed capacity over the next two years. We work closely with our clients to pursue these opportunities and our team capacity scales as we expand our portfolio. We have a clear idea on the type of tenders we will focus on winning over the next two years; we have aligned our technology partners to address these prospects effectively. Will you be looking for partnerships/collaborations with other companies? Our established physical presence in Qatar has attracted International technology manufacturers aiming at entering the regional market to approach us for collaboration opportunities. We value these engagements and have developed a business model that allows us to cooperate with selected companies while preserving our contractual agreements with our closest partner network. From the start, we have only promoted high quality European components and we continue to be highly selective in our product list to offer exclusively reliable solutions. On multiple occasions, we have engaged in creating strong consortia with prominent players to bid for complex tenders. This model has proven quite effective and allows us to replicate it easily, having woven a strong network of collaborators. What sort of opportunities do you see elsewhere in the Gulf and further afield in the Middle East? The middle east is a high-energy-consumption market and its various countries have embarked on energy sources diversification strategies whether to address shortage or achieve its CO2 reduction pledges in the global move to effectively address climate change. Each and every country in the region today, has set a renewable energy target; should these targets combined be realized, they would result in 107 GW of installed renewable power capacity (in the MENA region) by 2030. Investments on solar projects have reached $3.5 billion in 2015 in the MENA region; this is up from $160 million only 5 years earlier. Given in the pipeline of planned projects at utility scale and the large gap between the set targets and the current production, this figure is likely to double in the few coming years. The opportunities unveiling are in the form of Independent Power Projects (IPPs) mainly, where developers have been able to propose highly attractive prices of energy in the latest bids. Followed by distributed generation plans such as the net metering program in the UAE. Our local and regional set up is designed to allow us to target participation in these prospective opportunities, adapting to each country’s qualification criteria. Beyond these, we see a surging growth of renewables in oil and gas importing countries where the increasing domestic energy consumption needs to be met. Egypt, Jordan and Morocco are good examples of markets that are developing their solar power programs. In the seven years of our business operation in the regional market, we have been able to capture a significant share of the early solar projects implemented in the markets where we have physical presence. As projects scale and we reinforce our focus on quality, our learning curve serves a positive expansion of our portfolio across the type and size of the projects we take on. The next two years will witness the opening of at least one new regional office for us, starting with the UAE, where our participation in tenders and our local partnerships have paved the way for market entry. Our contracts will also span more widely into services to include third party projects in addition to our own implementations. 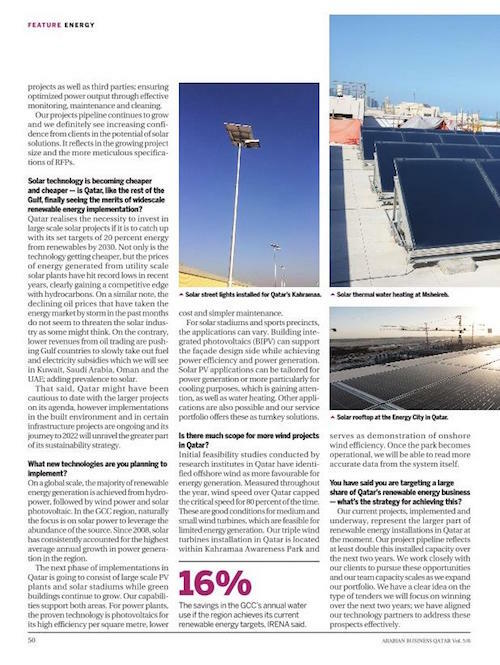 We will continue to advocate solar generated energy in its various implementations and we foresee an increasing adoption of cooling and heating solution applications namely in the sports and hospitality sectors in Qatar while plant-size PV will continue to grow.